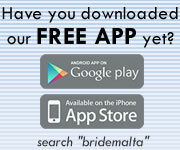 This is a short video with music that will show you how to use BrideMalta.com. It is our first video-tutorial so we hope you like it and find it useful! Feel free to contact us and send your comments and let us know if you would like to see other tutorials. Video may load in High Definition automatically. If it takes long to load, please lower the quality by choosing 480p or 360p. Enjoy!